Looking to finish off your basement and include a bathroom? Interested in learning more about PEX plumbing and its advantages? How about tiling your basement bathroom shower like a wild man? Welcome my friend. Grab a Fat Tire because this post is for you. The first step in any proper basement bathroom finish project is the plumbing. Maybe you’ve got pipes already roughed in, maybe you don’t. If you don’t, get ready to familiarize yourself with a jackhammer because you’re going to be busting up some concrete. 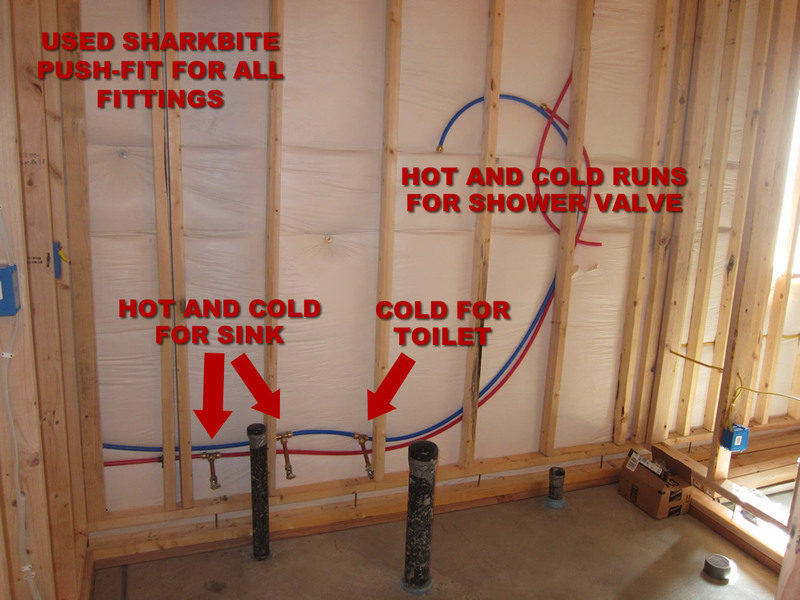 Even if you’ve got your basement bathroom plumbing already roughed in, there’s a good chance those pipes aren’t in the right spot and don’t fit your basement finishing plans. Once again, get ready to familiarize yourself with a jackhammer. – That means I didn’t have to worry about soldering a joint every time I needed to make a turn, like you would have to do with traditional copper pipe. 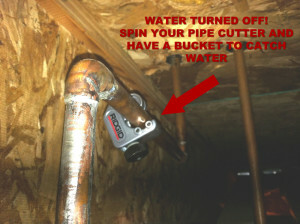 This also reduces the chances you’ll have a weak joint in your plumbing because you won’t have any! – As a result of not having to solder at every turn, you save an INCREDIBLE amount of time installing PEX piping. If you’ve followed any of my other posts I’m big on saving time and this is a huge time saver. – PEX pipes are cheaper than copper piping! Enough said. – If you live in an area where you’re subject to freezing temperatures, you’re probably familiar with frozen pipes. Say goodbye to frozen pipes with PEX. The flexible nature of PEX plumbing allows water to freeze and thaw typically without any issues. – If you check into the history of PEX, this stuff was used way back in the 30’s. It was primarily used in commercial construction and in the 2000’s it became standard for plumbers to replace copper piping with PEX piping. 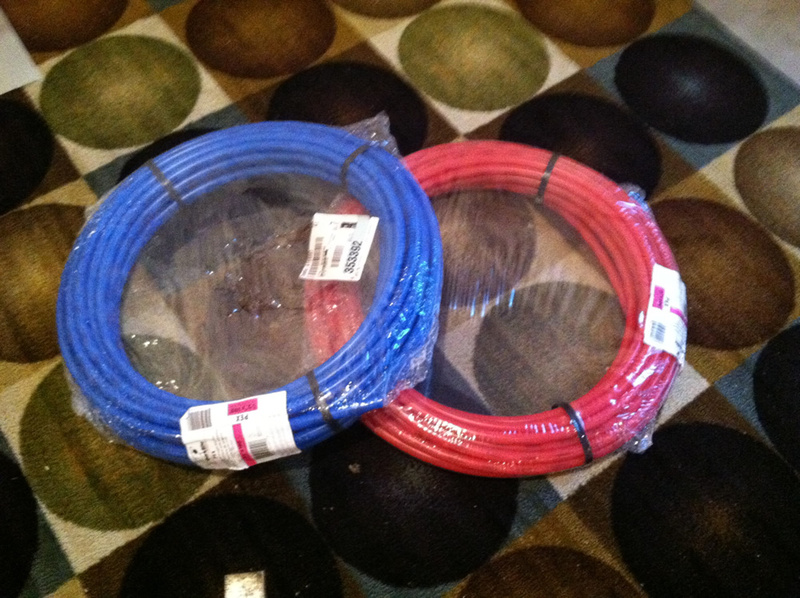 If you’re interested in using PEX piping in your basement finishing project I would highly recommend it. 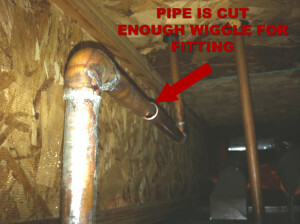 If you have questions about PEX that I don’t cover in this post, just join my basement finishing forum on PEX piping. Chances are your existing plumbing is all copper piping, and if that’s the case here’s a step by step guide to tapping into your existing copper piping with PEX. First you’ll want to locate an area where you’ll be able to tap into your existing copper pipes. Our main floor bathroom was directly above our basement bathroom so it was easy to tap into the hot and cold copper pipes that led to the sink above. – Check out what I needed for my basement bathroom plumbing project. Notice the really crappy PEX crimper I initially bought to try and save some money. It didn’t work at all, so I ended up spending more money on the heavy duty PEX crimper tool. – Everything else you’ll need is pictured but these four tools will make your basement bathroom plumbing project much easier. – Don’t make this rookie mistake. Cutting into your existing pipes without turning off the water first is a recipe for disaster, one that wouldn’t be very easy to explain to your wife. – First turn your water off then turn on all the sinks, showers, tubs, in your house until your pipes are clear of water. 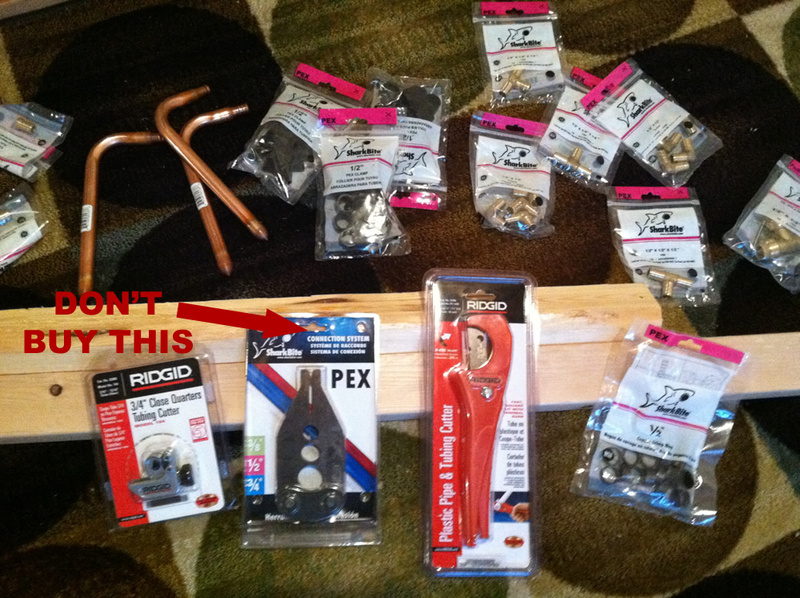 – Grab your pipe cutter, open it up and place it around your copper pipe. – To ensure a clean cut tighten the cutter until you make contact with the copper pipe and spin it around the pipe. When the cutter spins easily, tighten and spin it again. Do this over and over until you’ve cut through the copper pipe cleanly. 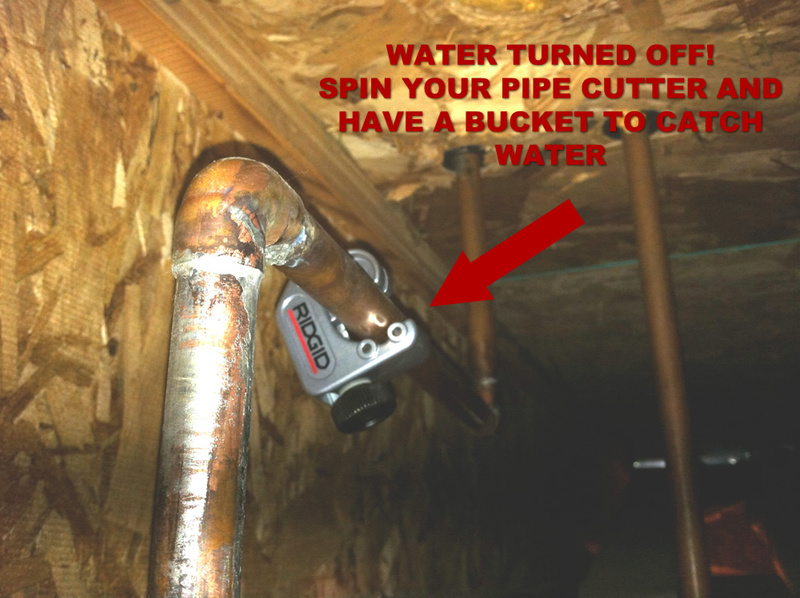 – Be sure to grab a bucket for any water left in your pipes. 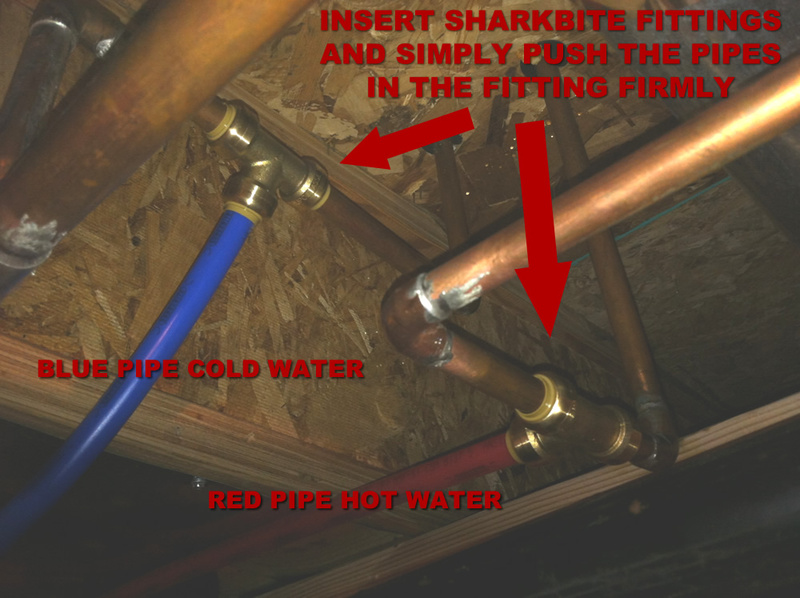 – My pipes had enough wiggle to allow for the SharkBite fitting to fit firmly in place where I had cut the copper pipes. You may want to cut a small section of pipe away to ensure the fitting is seated correctly and not causing your copper pipes to bend. After you’ve tapped into your existing plumbing, run your PEX piping through the wall behind your basement bathroom sink, toilet, and tub/shower. Again I chose to use the SharkBite push-fit fittings for both the sink and toilet. The shower valve I purchased came with PEX barb fittings, which in turn require metal rings and a crimping tool to ensure a solid fitting with no leaks. I decided to run a small copper pipe from inside the wall so instead of seeing PEX pipe coming out of the wall you saw a copper pipe. 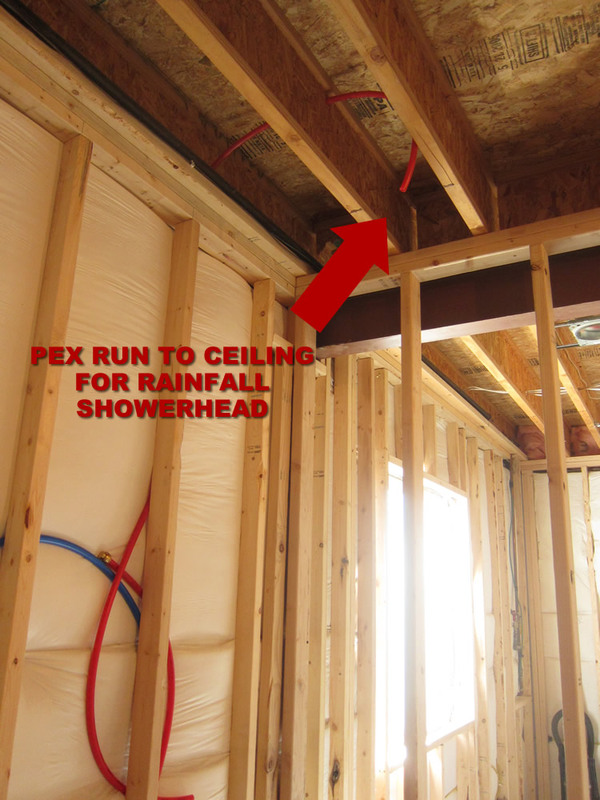 I then made one additional run of PEX piping from the shower valve location up into the ceiling joists for the rainfall shower head. You can see I also capped off the hot and cold runs with SharkBite push-fit plugs so we could turn our water back on. This is one section in which I didn’t take enough pictures so I’m going to walk you through what I purchased and how I mounted my shower valve. Here’s a great video on mounting the shower valve with PEX piping along with using the crimping tool that I suggest purchasing. Every situation is different, but understanding the gist of mounting the shower valve and using the crimping tool is the most important part. Once you understand that it’s a very straightforward project. More to come on how to install a bathroom exhaust fan. 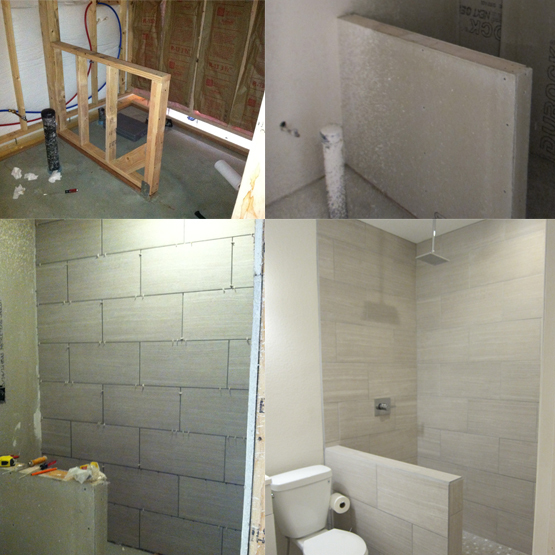 Stay tuned as I post more updates on finishing the basement bathroom, including tiling the VIP shower! Questions? Join my basement bathroom finishing forum. Thanks for getting this posted so quickly! I look forward to your future posts. we bought an existing home with a finished basement bath. Has a sink and toilet but no tub or shower. All tiled. I contacted the city to get the builders name and they no longer exist. How do we tell if there is plumbing for a tub or shower or if there is a reason the original home owner did not put one in? Thanks for the question. Yeah so this is a tough one. In order for them to tile, the drain for the tub/shower would have been cut off and capped flush with the floor to tile over it. That is if they had a rough in drain for the tub/shower to start. I would imagine they did, as most builders will include a rough-in in the basement. When was your home built? That would mean the only way you could possibly find that drain would be to take up the tile, which you probably don’t want to do. Do you have any neighbors in the area that had the same builder? If so you could talk with them and see what they have roughed-in to their basements. It would be ideal to walk through one if they had an unfinished basement. This way you could see exactly how they laid it out. Let me know if you’re able to talk with anyone in the area, hopefully that will shed some light on the situation! No rough-ins in my basement and the main drain line leaves the house an inch or two above our slab. I really don’t want to use a macerating pump, but it is pretty cheap. A grind pit under the slab would be nicer, but it’s still a pump that will eventually require maintenance and the cost of a grind pit is about as much as I was hoping to spend on the entire project. So, I guess I’m pretty much screwed? 1) Have you ever looked at raising your bathroom slightly off the floor? I’ve seen a few situations in basements, specifically in showers, where the floor is raised a few inches off the floor. I’m assuming it’s because of this exact situation, but it might be a possibility? 2) If budget constraints are too much, possibly removing a bathroom could open up the basement for a few other options that you hadn’t thought of before. You might be able to make the most of it by giving yourself a bonus room that will still be functional for you but also help with the resell value of your home. Hopefully this helps, but as I didn’t have to mess around with my rough-ins I’m not the best person to ask this question. Best of luck and thanks for the question! Let me know if you run into any other issues and have questions. Thanks for the fast reply, Tony! I’ve thought of raising the floor, and that may be the best solution and still have a gravity system… just worried how to tie that in with the rest of the basement. Thanks again! It’s never easy is it?!? 🙂 Best of luck and let me know if you run into anything else! How do you make the walk in shower with either a pan or just tile like you have waterproof with the floating walls? I’m having trouble wrapping my mind around this with attaching the shower pan to the floating wall. Do you have that half wall connected to the floating wall? do you have any more close up pics of that section? Hopefully that gives you a better idea of how I accomplished this, let me know if you have any other questions and best of luck!